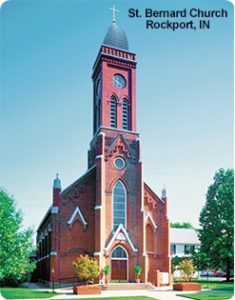 St. Bernard Catholic Church in Rockport, Indiana is a community of faith centered on the Eucharist where all are welcome. We commit ourselves to excel in life-long religious education, hospitality, outreach and stewardship in the community. You are invited to worship with us at St. Bernard. St. Bernard Catholic School welcomes families of all faiths providing a safe Christian learning environment for students Pre-K through 8th grade.